I hope you all had an amazing New Years. I stayed at home all evening and watched DVD's. As promised in a previous post about my holiday, I'm putting up a brief tutorial about one of my looks. Apparently, it looked a bit '1920's' and I personally loved how it turned out. It didn't take me a lot of time to do and I didn't put a lot of products on either. Step 1) Put a little bit of concealer under eyes and blend well. (I was a bit jetlagged when this picture was taken and also hadn't slept properly in 3 days). I used Benefit's Lyin' Eyes Concealer, which is an absolute lifesaver. Its light andperfect for someone like me, who doesn't wear a lot of make up. Step 2) Add a bit of pink/neutral coloured eyeshadow. I used a Victoria Jackson palette here. I put a natural brown colour up to my eyebrows, then a light pink up to the crease of my eye. Step 3) Black eyeliner. I've always used Rimmel Liquid eyeliner. I put some on my upper eyelid and make a slightly upward flick towards the end. I also put liquid eyeliner on my waterline (it took lots of practive to perfect that). Step 4) Lots of blush. I used a pinkish shade from H&M. I put it on heavier than I've had it on before. Step 5) Add red lipstick, which is essential to the whole look. Again, I'm using Rimmel. 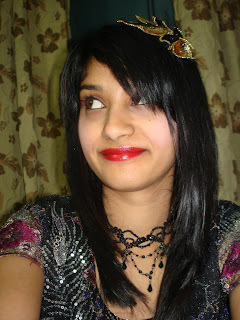 My mum hates red lipstick and always complains when I put it on. Step 6) Add a headband. The one I'm wearing is from Nubianonsense and gla.MOR.ous and is so gorgerous. P.S. I was just contacted by Delancefashion about a cool new community. Its called Delancefashion community and it's kind of like facebook for fashion lovers. It launched a few days ago and looks like a lot of fun. I definitely recommend you guys to sign up for it. You have such smooth and clear skin Sherin... I love your make-up, it's not over-the-top but it just looks so natural except for the red lips of course. You rock the red lips. You look gorgeous. :) And your headband looks perfect. I shall be looking at this Delancefashion I think. Love how you made your eyes and that red lipstick looks good on you! I'm not really a make-up person but I like seeing others wearing make-up.lol!Right now what I need is a good concealer to cover by ever growing eye bags. I love that hairband - fabulous look! I really like the red lipstick on you! great tutorial! Lvoe Ur hairband so much! You're spectacular with red lipstick! The red I use is MAC's Russian Red - and you? You look gorgeous though so don't stop wearing bright red lipsticks. A big yes to Benefit! They have some amazing products. Congratulations on your "Nubianonsense headband"!!!! Great tutorial, Sherin! You look absolutely gorgeous in that photo! Your red lipstick is perfect on you. Red lips are always, always rockin- no matter what fashion magazines say! Oooh! I love the red lipstick :) Pretty! looove this look! Thanks for the tutorial! THe red lips make it so cute! That is a perfect red on you too! !